Law enforcement officials say the man who set off a crude pipe bomb in the New York City subway system Monday had watched Islamic State propaganda on the internet and told investigators he acted in retaliation for U.S. military aggression. 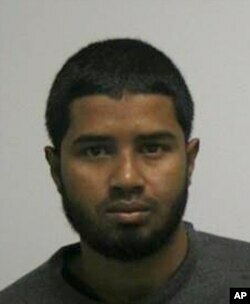 Authorities have identified the suspect as 27-year-old Akayed Ullah, a Bangladeshi immigrant and former taxi driver. They say he used Velcro and zip ties to strap the explosive device to his body, but that it did not fully detonate. 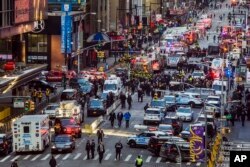 Monday's attack took place in a tunnel that connects the Port Authority Bus Terminal and Times Square subway stations. Security video shows the attacker walking among the rush-hour crowd and then smoke filling the area as the device goes off. The man is then seen laying on the ground as people rush away from the scene. The attacker was taken to a hospital in serious condition with burns on his hands and torso. Three other people suffered headaches and ringing in their ears. "This was an attempted terrorist attack," said New York Mayor Bill de Blasio. "Thank God the perpetrator did not achieve his ultimate goals." Albert Fox Cahn, legal director for the Council on American-Islamic Relations in New York, issued a statement on behalf of Ullah's family. It says they are "heartbroken by the violence that was targeted at our city today, and by the allegations being made against a member of our family." The family also questioned the actions of investigators, saying law enforcement officials held a teenager out of classes to interrogate him without a lawyer or his parents and kept young children out in the cold. "These are not the sorts of actions that we expect from our justice system, and we have every confidence that our justice system will find the truth behind this attack and that we will, in the end, be able to learn what occurred today," the family said. "Congress must end chain migration," the president said in a statement. "The terrible harm that this flawed system inflicts on America's security and economy has long been clear. I'm determined to improve our immigration system to put our country and our people first." "The government of Bangladesh is committed to its declared policy of "zero tolerance" against terrorism and condemns terrorism and violent extremism in all forms or manifestations anywhere in the world," the statement said. A massive emergency response above and below the ground shut down the area around the attack in midtown Manhattan, but by afternoon the scene returned to normal. Law enforcement officials work following an explosion near New York's Times Square on Monday, Dec. 11, 2017. "The fear is always present with us, those of us that live in New York," Laura Gonzalez, a New York resident who was in Port Authority Monday, told VOA. Gonzalez said that in New York, people learn "to go to work, to go shopping, to live the life we need to live." "Crazy people are everywhere, every time, and New York is a big place, and a public place so it is normal I think," Ruben Schwartz, a tourist from Germany, told VOA. An IS sympathizer drove a rented truck along a bicycle path in Manhattan in late October, killing eight.